Disqualifications marred the third finals session: a winning relay team's joy was deflated when they were disqualified for an early takeover; a second-place 400 freestyle swimmer found out after the race that she had false-started, and a swimmer fell off the block and was told to leave the pool. On the other hand, Great Britain had much to celebrate as its swimmers picked up two golds and a bronze to take the spotlight off the Australians temporarily. The men's 100 I.M. was the first final. It was an easy win for Jani Sievinin (FIN), who took the lead from the start and and powered to a body-length win with 54.18. The rest of the field bunched together, fighting it out for the remaining medals. Matthew Dunn (AUS) took the silver with 54.77 and Jakob Andersen (DEN) the bronze with 55.05. Sievinen was generally pleased. &QUOT;It was great to set the championship record and I'm happy to win at my first short course championships. I feel great in the pool and enjoy the competition but I expected more spectators.&QUOT; It was a comment echoed by everyone as the 8000 seats were filled mostly by the swimmers, their parents, and coaches. As for paying spectators, they were scarce. 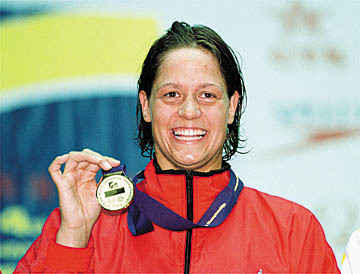 Martina Moravcova (SVK) was the class of the women's 100 I.M. and swam well ahead of the field to win in 1:00.20, her personal best and a European record, but Jenny Thompson's world and championship record of 59.30 was out of reach. Thompson scratched after her prelim swim the day before-the semi-final swims in all her sprint events were beginning to take their toll. Moravcova, after years of playing second banana, won her first world title. &QUOT;I wanted a faster time but I'm happy. I swim the 200 I.M. tomorrow and feel confident about a fast time.&QUOT; Lori Munz (AUS) was second with 1:01.40 and Oxana Verevka (RUS) third in 1:01.55. The men's 100 breaststroke was a repeat win for Patrik Isaksson (SWE) but it was close. After taking the lead, he struggled at the finish to touch in 59.69. Domenico Fioravanti (ITA) closed in to touch second in 59.88 and Morgan Knabe (CAN) was third in 59.93. Nadezdha Chemezova (RUS) was the winner of a fierce battle in the women's 400 free. She battled for the lead throughout the race with Chen Hua (CHN), winner of the 800 the previous night. Chemezova, with great technique, lengthened her stroke toward the end and increased her kicking to surge to the wall in 4:05.23, a three-second drop from her previous best. 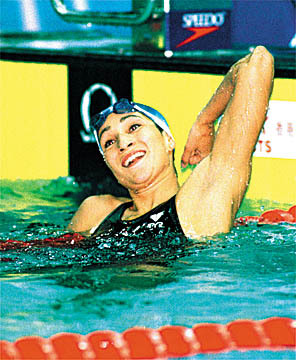 Although Chen finished second, she was subsequently disqualified for leaving early at the start. Qin Caini (CHN) then moved up to second with 4:06.34 and Joanne Malar (CAN) moved to third with 4:06.83. Sandra Volker (GER), with her superior underwater kick at the start and turn, was the class of the 50 backstroke, winning with 27.63 over Mai Nakamura (JPN) in a close 27.73. Kelli McMillan (AUS) was third with 28.29. &QUOT;It's a great feeling to be a world champion,&QUOT; Volker said. &QUOT;All I wanted was to win tonight. A world record would have been a bonus.&QUOT; Volker has the current world mark with 27.27. The women's 50 free was somewhat marred by Therese Alshammar (SWE) falling in the water-an automatic disqualification. (Later an even worse development was to descend on the unfortunate Swedes.) The remaining seven got off the blocks with Inge de Bruijn in the lead and winning with 24.35. Jenny Thompson (USA) placed second with 24.57 and Alison Sheppard (GBR) third with 24.97. 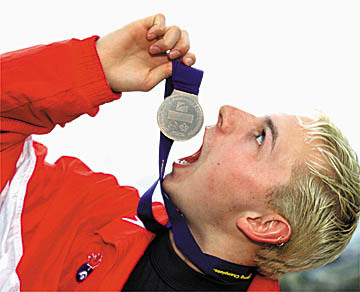 World record holder James Hickman (GBR) was in his own class, winning the 200 fly with over a body length of clear water ahead of the rest of the field. His winning time of 1:52.71 was a championship record.